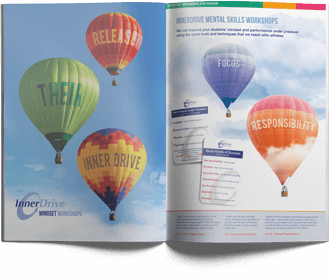 What you Provide: The school is responsible for providing a safe working environment for the InnerDrive coaches. Please ensure that each venue for the workshops includes the requisite number of seats, a projector, a screen and a working sound system. A few, but not all workshops require some tables. We will let you know if this is the case. Please let us know if any of your students have any additional learning requirements we should know about. What we Provide: We will provide the agreed number of coaches. Coaches will arrive approximately 45 minutes before the first workshop in order to ensure that the IT set up works. Each coach will arrive with all necessary handouts and equipment. Our coaches all have enhanced DBS checks and will arrive with photo ID. If this is not the case then they will let you know at reception on arrival. Cancellations must be made in writing to info@innerdrive.co.uk as well as by phone to us on 02086933191 during office working hours 09:00 – 17:00. Payment Policy: Upon completion of the workshop, InnerDrive will email an invoice for our work which is due payment on 30 day terms. Payment can be made by either cheque or bank transfer. We can’t wait to work with you, and look forward to meeting you in person.